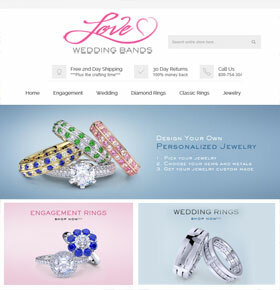 LoveWeddingBands is a leading online jewelry store that provides a wide range of customized and unique collection of wedding diamond jewelry including engagement rings, pendants, earrings and more in the USA. We were approached by the client to upgrade the Magento version of the existing website and add new features. The website was running on Magento 1 and the challenge for our Magento developers was to upgrade it to Magento 2 version without any data loss. Having rich experience in accomplishing all types of Magento online store development tasks, we successfully upgraded the version and added various new functionalities for improving the user experience. We added new attributes to the product listing page like material, purity, stone color, etc. We added a functionality that shows the price of a product and its detailed information on the basis of the purity. Also, we added other useful functionalities like customer reviews, delivery & returns, recently viewed products, etc. On the whole, we made the website fully-functional and user-friendly.